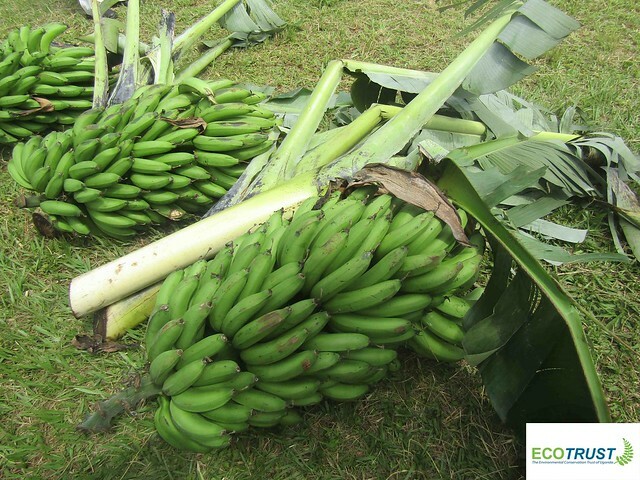 Cases of Human Wildlife conflict in Kasongoire parish, Budongo subcounty are reaching critically high levels with an average of 2 Chimpanzees killed or injured by local community members every other day. Two children were killed by chimpanzees in 2017, and they’ve been several reported cases of chimpanzee attacks on children between 1998 and 2015, leaving many of them with scars. As a result of the retaliatory killings, the number of chimpanzees in this migratory corridor (between Budongo and Bugoma Forest reserves), has drastically reduced to only 200 in number. 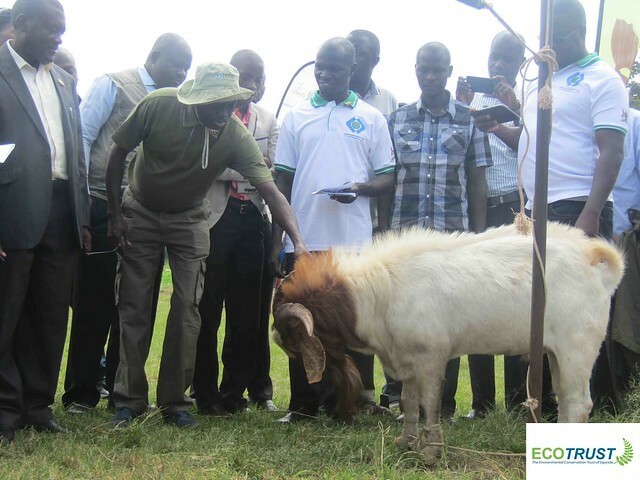 A joint collaboration between USAID, WCS (Wildlife Conservation Society), UBF (Uganda Bio-diversity Fund), ECOTRUST, The Jane Goodall Institute (JGI), Chimpanzee Trust and The Ministry of Tourism, Wildlife and Antiquities (MTWA) led to the formation of a Human- Wildlife Conflict Resilience fund, with the main purpose of enabling these affected communities live in harmony with wildlife. 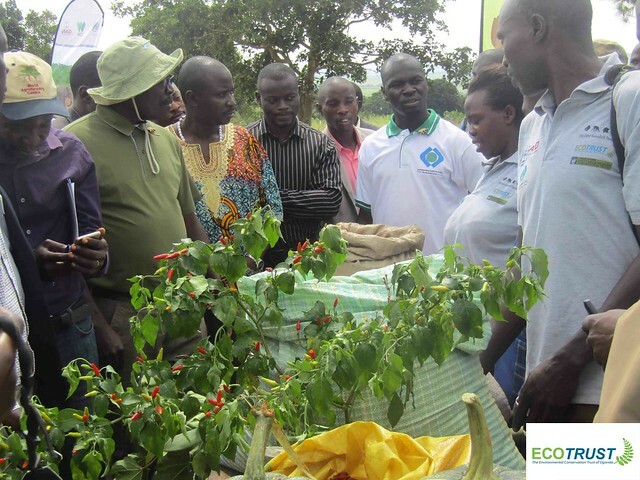 Whilst ECOTRUST managed the technical design and operations of the fund, UBF, USAID and JGI played a crucial role in sensitizing communities on how-to live peacefully with these creatures and offered training in commercial agriculture for crops like onioins and chilli pepper, which are natural deterrents to Chimpanzees. 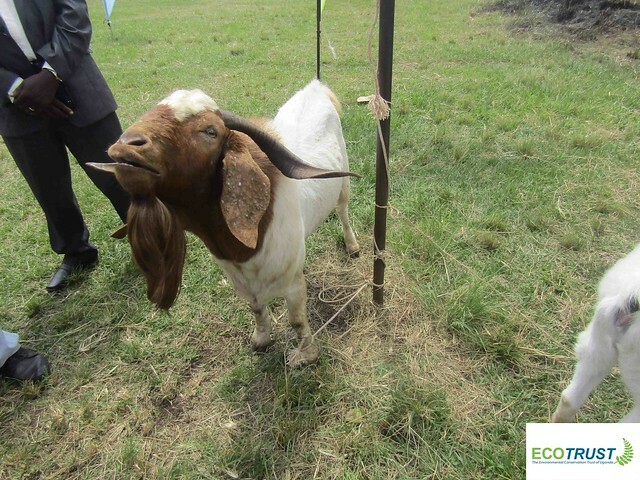 The JGI Roots and Shoots programme continues to work closely with children in Kakoda community to raise awareness on the importance of these creatures in our eco-system and how best to avoid conflict with them. Community forest monitors have also been introduced to collect data for research on wildlife in the region. So far, a number of community members have been able to borrow money from the fund for development projects. To date, there hasn’t been any reported cases of an attack since the fund came into effect. 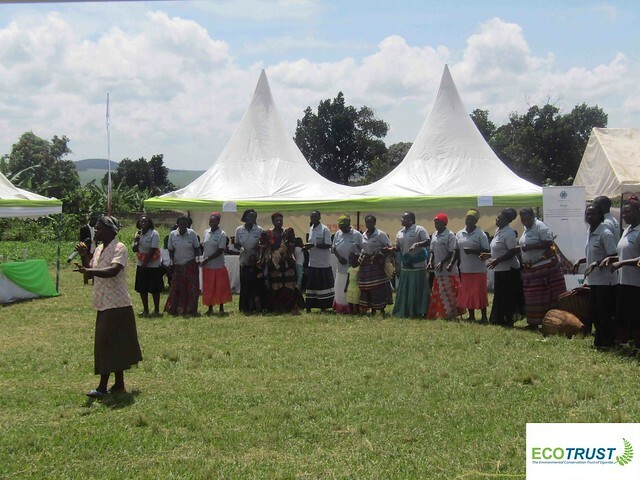 The sub-county which received UGX 12 million from different funding partners, channeled through five SACCOS (Savings and Credit Cooperative Organizations) for development projects earlier this year, has already registered UGX 900,000 in profit, as reported by the sub-county chairman at the event. The fund has also been used to compensate some of the previously affected victims of attacks from Chimpanzees. Kinyara Sugar Works was generous enough to provide a free clinic and ambulance for such attacks in this sub-county. 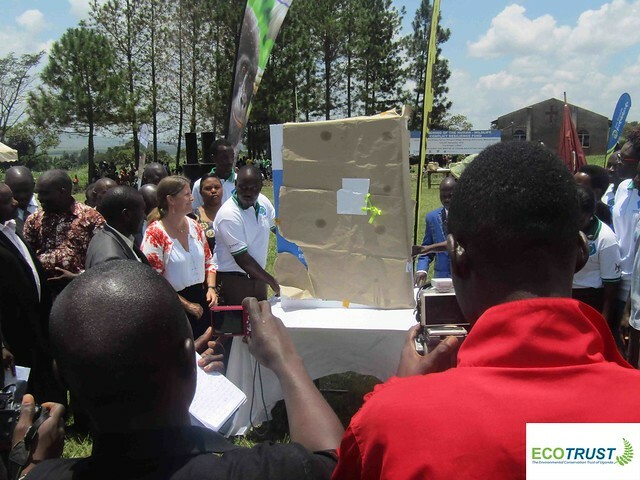 The official launch, which took place on the 20th of September 2018 at Kasongoire Primary School, Masindi District, was well attended by development partners, government representatives, private sector and civil society. 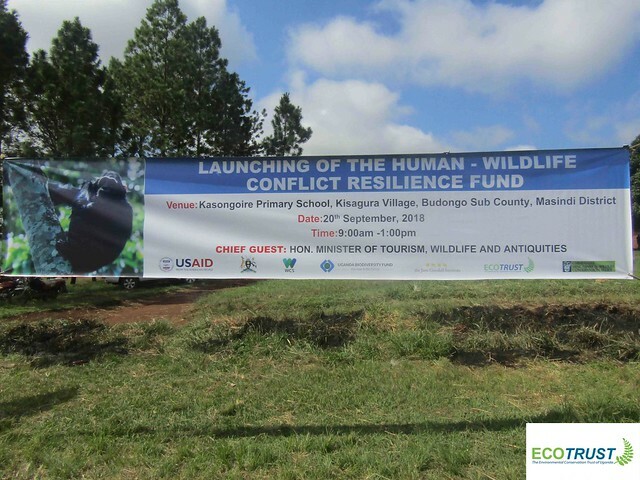 These included ECOTRUST, JGI, UBF, WCS, Chimpanzee Trust, Ministry of Tourism, Wildlife and Antiquities, USAID to mention but a few. The guest of honor, representing the Minister of Tourism, Wildlife and Antiquities was Stephen Okiror. On show was the local community produce, both agricultural and livestock. The kakoda representative choir and the local primary school expressed gratitude for the fund through music dance and drama. Emphasis on the need to do more to protect community forests. The chairperson – UBF, emphasized the need to create a culture of integrity and proper accountability amongst community members that will be accessing this fund. 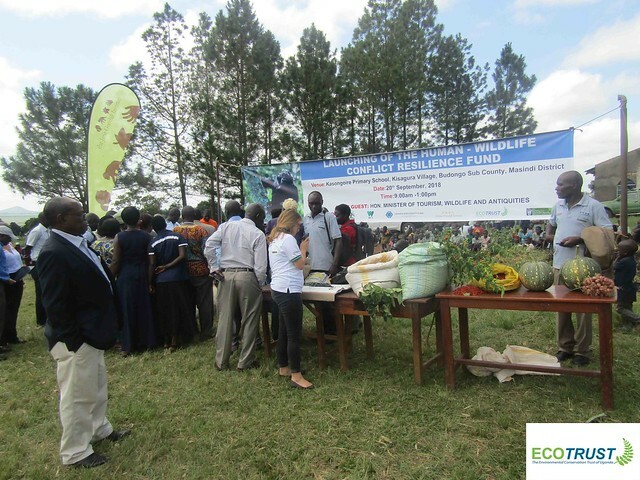 He added that the fund will enable the community to stay afloat and prevent further damage to their crops. The USAID, head of mission to Uganda, officially launched the fund, highlighting that it is a sustainable compensation mechanism and USAID is committed to the success of this project. She added that there is need to maintain Uganda as the Pearl of Africa with its natural integrity. The representative of UWA on the occasion noted the importance of having lessons documented for this particular project, which can later be applied to other regions.